On this date in 1944 French poet, writer, and pio­neering aviator Antoine de Saint-Exupéry vanished on a recon­nais­sance flight off the Medit­er­ranean coast near Marseille, France. Best known for his 1943 novella The Little Prince (Le Petit Prince), and to a lesser extent for books about his avi­a­tion adven­tures, including Night Flight (1931) and Wind, Sand and Stars (1939), the 44-year-old Saint-Exupéry flew for Gen. Charles de Gaulle’s Armée de l’Air (Free French Air Force). 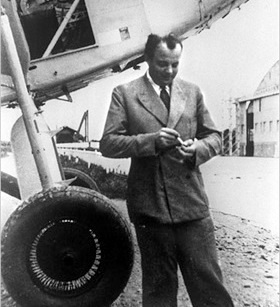 A success­ful com­mer­cial pilot before the Ger­man in­vasion of his country, Saint-Exupéry joined the French Air Force, flying recon­nais­sance mis­sions until France’s armis­tice with Nazi Ger­many in June 1940. Like de Gaulle, Saint-Exupéry fled France, traveling to America to per­suade the U.S. govern­ment to enter the war against Ger­many, and where he wrote pieces and lec­tured audi­ences in the U.S. and Canada in support of the French Resis­tance. It was during his 27‑month stay in the States that he wrote and illus­trated the 104‑page chil­dren’s classic, The Little Prince. In the spring of 1943 he left for North Africa in an Amer­ican military con­voy to fly with the Algiers-based Armée de l’Air. Grounded for eight months for wrecking a Lock­heed P‑38 Lightning through engine failure on his second mission in North Africa, he was reinstated to flight duty on the per­sonal inter­vention of the Deputy Com­mander of the U.S. Army Air Forces, Gen. Ira Eaker. Saint-Exupéry’s final mis­sion, his ninth, was to fly his un­armed recon­nais­sance ver­sion P-38 Lightning from the island of Cor­sica over the French Rhône Valley to collect intel­li­gence on Ger­man troop move­ments in support of opening a second French front in southern France in mid-August 1944 (Operation Dragoon). He never returned. Word of his dis­appear­ance spread across the literary world and then into inter­na­tional head­lines. Several days following his dis­appear­ance an uniden­ti­fiable body wearing French mili­tary colors was found in a bay near the small Proven­çal port town of Carqueiranne and was buried there that Septem­ber. In 2000 Saint-Exupéry’s P‑38 Lightning was found in the seabed near Marseille. Left: Antoine de Saint-Exupéry (1900–1944), French writer, poet, and pioneering aviator in Toulouse, France, 1933. In the early 1920s, while stationed in Strasbourg with the military, Saint-Exupéry earned his flying wings and became a pilot. (He was twelve when flew for the first time.) In 1926 he signed on as a pilot for Aéro­postale, a private airline that flew mail from Toulouse, France, to Dakar, Senegal. The next year Saint-Exupéry, in southern Morocco, began writing his first book, a memoir called Southern Mail, which was published in 1929. In 1931 he published Night Flight, which won instant success and the prestigious Prix Femina. His next novel, Wind, Sand and Stars, was published in 1939. A great success, the book won the Académie Française’s Grand Prix du Roman and the National Book Award in the United States. Right: First published in the United States in French and English in early 1943, Le Petit Prince (The Little Prince) is the tale of a small inter­plane­tary traveler and his friend­ships with a pilot, a rose, and a fox. The book—the most widely trans­lated book in the French lan­guage—has been trans­lated into more than 250 lan­guages and dia­lects and is among the top three selling books in the world. 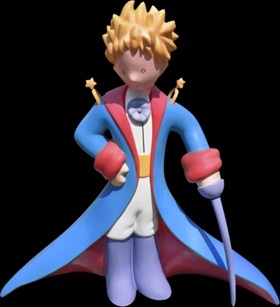 The Little Prince has been made into movies and TV films in a number of languages as well.